Just a quick one today as we are about to go on an adventure to Snape: a walk along the river and then lunch at the Crown. I will take photos, I promise. I made this a couple of weeks ago when we ate it as is for dinner – and again last night – when we ate it with this wonderful roast chicken with bread stuffing from Dana. More on the chicken later…. The salad is from The British Larder cookbook by Madalene Bonvini-Hamel. Their pub/restaurant was just down the road from us – well about 4 miles away or so. We used to walk there on Boxing Day (see here) and feast on deliciousness. It has changed hands now so I am having to cook their wonderful dishes at home. 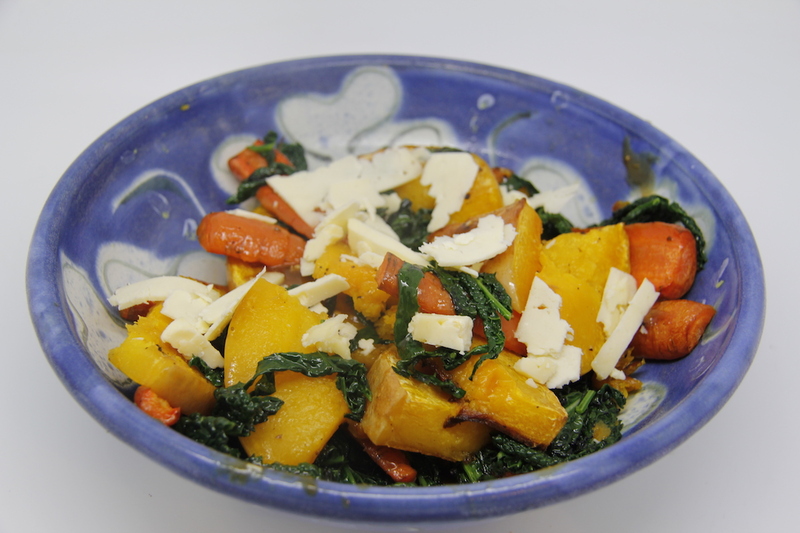 Warm Squash, Carrot and Cavolo Nero Salad: butternut squash, carrots, cavolo nero (young, small leaves), olive oil few shards of a ewe’s milk cheese such as Berkswell, or Parmesan – I used a Caerphilly; for the dressing – 1 tbs of mustard, 1 tbs of balsamic vinegar, 3 tbs of olive oil, crushed garlic clove, 1 tsp of honey. 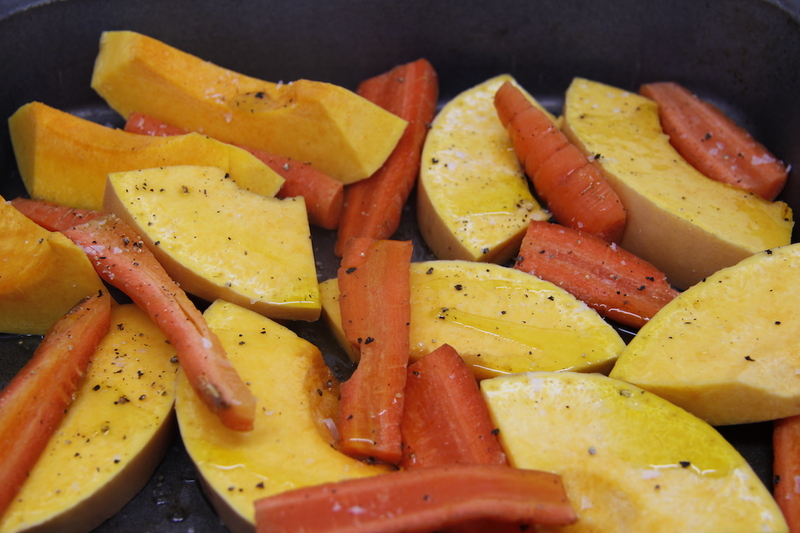 Cut the carrots in half lengthwise, slice the squash in half and then cut into slices about 1cm thick-ish. Pour over a little oil and mix to cover then spread out on a roasting tray and roast in a hot oven for about 25 minutes until cooked. 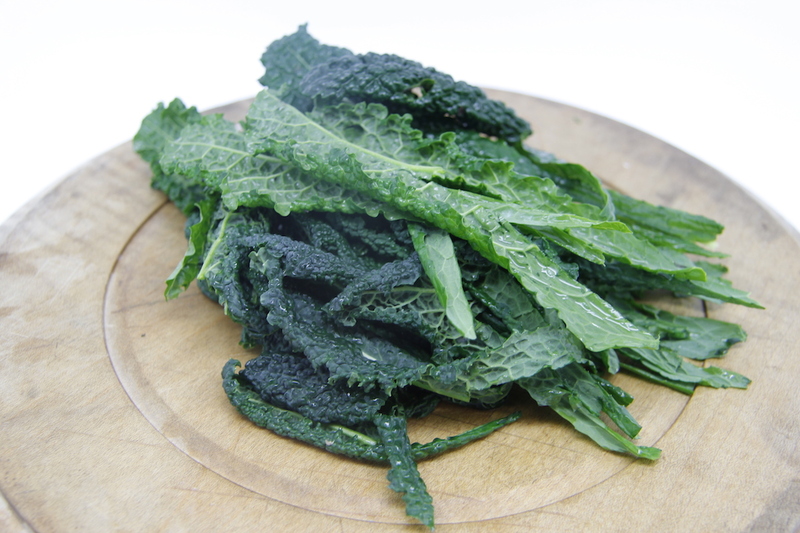 Just before the squash and carrots are ready heat up a little oil in a frying pan and gently stir-fry the shredded cavolo nero. Mix the vegetables together, pour over a little of the dressing – you won’t need it all. Scatter the cheese on top and eat while still warm. Now this is a seriously yummy salad!! Thanks for the shoutout babe!